Boo! Halloween is tomorrow. Our decorations are up, costumes are ready, treats purchased and the kids are super excited. We carved our pumpkins on the weekend and as I was scooping out the insides of the pumpkins, I remembered the pumpkin seeds I had bought at Bulk Barn in the summer for my dad’s garden birthday cake and so I thought it would be fun to make our own. I went to my go-to website and found this recipe. It had great reviews so we made them. They turned out fantastic. They passed the family test. Two of my kids liked them enough to take them as a snack to school and my husband has not been able to stop eating them while watching tv. 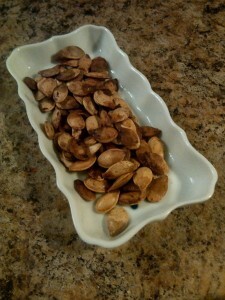 So if you haven’t carved your pumpkin or if you did and kept your seeds, give them a try!